One of the most noticeable and interesting characteristics of the Jewel of Muscat is that its planks are sewn together. Today, this technique for joining planks is rare, so very few people have ever seen a sewn boat or ship. But I come from the village of Mattool in Kerala, India where we still use this old technique. Indeed, my father was a sewn boat builder and I learned the craft from him. The sewn boats of Kerala are much smaller now than in years past–generally nothing larger than eight metres, and now mostly limited to fishing canoes. 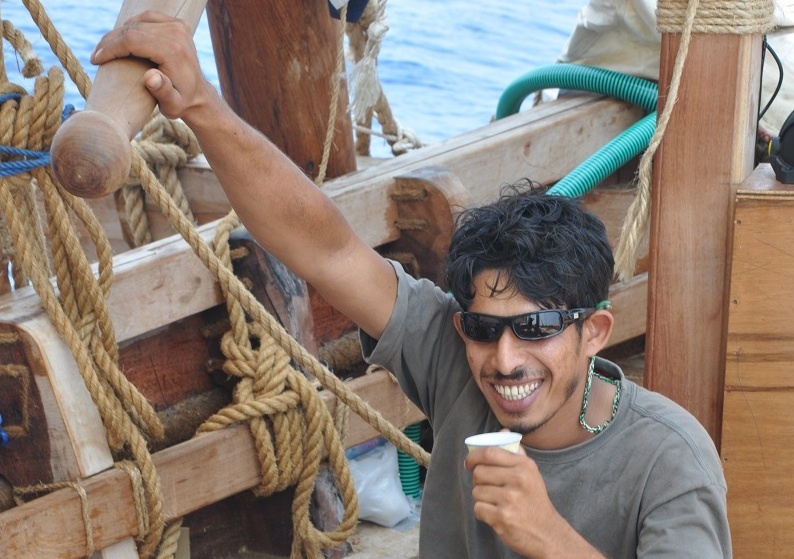 When I first arrived in Oman three years ago, my job had nothing to do with boats–I served tea in an office. But Tom Vosmer had already begun planning the Jewel of Muscat and had sent Luca Belfioretti to Kerala to look for men who still knew how to stitch boats. As luck would have it, Luca met a friend of mine who told him about me, and mentioned that I was already living in Muscat. The next thing I knew, I had an interview with Luca and he offered me a position reconstructing an 18-metre, 9th century sewn ship. I could not have dreamed of a better job. When I look back now, it seems like yesterday that we first laid the keel to the Jewel of Muscat on the beach in Qantab. But when I think of all the work that has taken place between then and now, work that has involved so many dedicated and talented people, it seems like a century. Every phase of construction was both exciting and challenging and I am so happy to have been a part of the process. I’ll never forget my joy the day we launched the ship and it slipped into the sea–its new home–for the first time. Now we are sailing peacefully in the Andaman Sea only 170 miles from our next port of Penang. For me, these are perfect days for sailing, the best of this leg. The ship is cruising at 4.5 knots under clear skies, and she is handling well. In fact she has handled well throughout the voyage, even during the terrible storms. Every time I look at the ship–its hull, its rudders, its masts and sails–I am filled with pride, and I give thanks that I was given the opportunity to be a part of its construction and to be a member of its crew. This project has changed my life in many ways–all of them good. I only hope that when this voyage is over, I’ll be able to continue building and sailing historical boats using the skills I have developed during my time on the Jewel of Muscat.